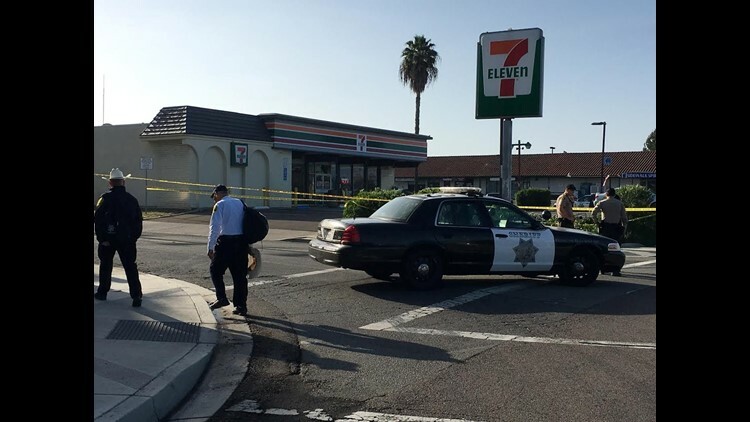 VISTA (CBS 8) - A man was shot and injured by an off-duty sheriff's deputy Sunday morning when he allegedly backed his vehicle into two other off-duty deputies who were attempting to break up a fight at a Vista convenience store. The incident happened about 1:59 a.m. in front of the 7-11 store in the 1500 block of East Vista Way when the off-duty deputies drove by and spotted an altercation near a parked car in front of the store. The deputies approached the crowd in an attempt to intervene and de-escalate the situation. Suddenly, one of the suspects involved put the parked vehicle in reverse and struck two of the off-duty deputies. One of the deputies fell beneath the vehicle. The driver of the vehicle then drove towards a third off-duty deputy, prompting the deputy to fire multiple rounds at the driver of the vehicle, striking him twice. The vehicle came to a stop and the deputies provided first aid to the driver who had been shot. The two off-duty deputies who were struck by the vehicle suffered non-life threatening injuries and were treated at local hospitals. The driver, 32-year-old Alejandro Blacno, was shot twice in the torso and is expected to survive. The incident is being investigated by detectives from the Sheriff's Homicide Detail and the Vista Sheriff's Station, including whether the off-duty deputies involved properly identified themselves to the crowd. "That's a key part of the investigation and we do not have all the facts on that yet. But, that's going to be something that we're looking at," said Lt. Kenneth Nelson of the Homicide Detail. Blanco will be arrested and booked into jail on multiple counts of assault with a deadly weapon. Deputies asked anyone with information to call the homicide detail at (858) 974-2321 or (858) 565-5200 after business hours, or San Diego CrimeStoppers at (888) 580-8477.